If you all could remember this post, you will know the Aachi who cooked up some amazing recipes of her origin, which is you guessed right, Chettinad. This recipe is also learnt from her and which I would like to dedicate to her. I could very easily say that this is the most loved side dish made of Vazhakkai in my home. Trim the edges of the plantain and slightly scrape the skin. Take care not to peel the skin fully. Cut into cubes and immerse in water to avoid discoloration as shown in the picture. Take a heavy bottomed kadai and heat the oil. Add the mustards seeds and once t pops add the urad dal and sauté till it turns light brown. Now add the chopped onions and 1 sprig of curry leaves and sauté till the onions turn translucent. Add the ginger garlic paste and the chopped tomatoes and cook till the tomatoes become mushy. Now add the red chilli powder, turmeric powder, coriander powder and salt and mix well. 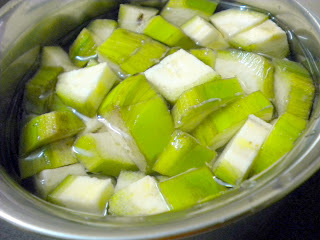 Add the plantain cubes and ¼ cup of water. Mix well and close with a lid and cook for 10 mins. Remove the lid and mix lightly in between. Add more water if the curry is dry. Cook till the plantain is tender and soft and switch off. Add another sprig of curry leaves and cover with the lid for another 10 mins for the curry leaf flavor to merge with the curry. Serve hot with Drumstick sambar rice. It tastes just too good. Add more water only when needed. If you add more water at one go then the plantain will get over cooked and turn mushy and the skin will also separate. If you are planning to omit ginger garlic paste then Don’t. Looks spicy and yummy!!! Love them..
Chettinand Curry looks delicious. Excellent recipe. Looks so inviting. You have made me hungry…the curry looks delicious. super interesting and delicious curry !! Wow! It’s droolworthy and scrumptious! Yummy! delicious! i have never tried cooking with raw bananas, but this is really tempting…. That’s such a tempting platter, Radhika! Next time I make vazhakkai I’ll try this recipe- bookmarked! Love vazhakkai, and this curry looks so delicious. Love this curry very much dear. Looks so delicious. Chettinad version sounds really good,nice recipe Radhika! Hmm..I have to get some raw plantain to try out this recipe..looks great and yum!perfect with rotis..
Spicy and yummy curry…makes me want some right away…Have sent my entry..
Wat a tempting click dear,makes me hungry…Nice version of Vazhakkai curry…Yummy. Excellent recipe and came out very tasty. Thx for posting the details – it helped immensely. yummy curry, i have not tried like this. Next time i will. thanks for sharing and inviting picture.